I do know that the Cricket World Cup has been an outstanding success: Christchurch’s return as an international venue; the destruction of England at Wellington; the Auckland nail-biter against Australia; Ireland’s triumph over the West Indies at Nelson; Martin Guptill topping the batting with his 237 not out and Tim Southee the bowling with 7/33. The International Cricket Council must be bonkers to stick to its plan to cut the number of teams from 14 to 10 for 2019. I also know we will soon be inundated with “studies” that the tournament has delivered a huge boost to the economy. The Ministry of Business, Innovation and Employment will be at the forefront. But what has been obvious anecdotally for a long while has been confirmed more systematically by Professor Andrew Zimbalist in his new book Circus Maximus, reviewed in the Economist a couple of weeks ago: it’s all crap. He shows that perhaps the one thing economists have proven beyond any doubt over the past hundred years is that major events never deliver any but the most fleeting economic benefits, if any at all. The overwhelming majority of events are a drain on GDP. The same is true of sports teams and new stadiums: none has ever delivered an improvement to employment or GDP. It would be remarkable were it any different for concerts, arts exhibitions, sculpture walks and the rest. Oh, yes, there are plenty of analyses that show otherwise: those commissioned by the sports or arts associations who want the honour of hosting the event, the politicians and bureaucrats who want the front-row seats and tourism lobbyists who perceive they will gain financially, but even they’re usually wrong too. Hooton later echoes a line I've often heard from Seamus Hogan, but that I'm not sure he's blogged [Update: here]: if you're going to run these things, justify them on the basis of their being a fun party and nothing more. Maybe the party is worthwhile; maybe it isn't. But don't pretend that it has big economic benefits. John Ansell's reach is long: the billboard campaign he ran for Don Brash has been picked up in Canada. This apparently isn't the first appropriation of a great billboard idea. A few others were sent me by an email correspondent. 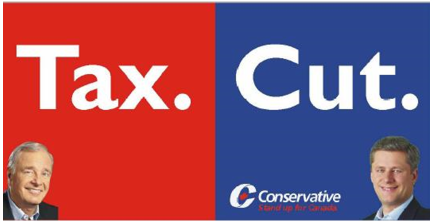 I'm not sure if these were actually used in the 2006 Canadian election, or if they were mocked up by party activists. All of these kept the very simple contrast. The NDP's version (again - I don't know whether it was from activists or the party proper) was a bit ... cluttered. It reminds me of Homer's attempt to chime in during "Who needs the Kwik-E-Mart". 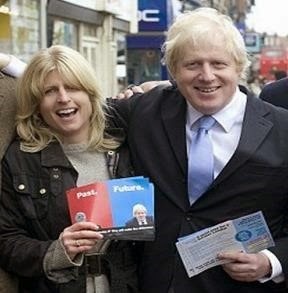 Boris Johnson's even been in on the theme, but with the appropriate style. If Hartford, or anybody else, is able to come up some better way of processing GST at the border, without imposing undue hassle on either those who might be deterred from exporting to New Zealand or on Kiwi shoppers, and without collection costs that exceed the value of the GST collected, that would be great. I’ll quibble a bit at the wording, the collection costs should not exceed the value of the improved allocative efficiency from removing a tax distortion, not the revenue collected, which is likely a much tougher hurdle, but either way I’m prepared to give it a go. I don’t imagine for a moment that any government would implement this policy. Instinctive mercantilism is too strong in all voters, and only a few have experienced the epiphany of general equilibrium reasoning. But this is not a “modest proposal” in the Swiftian sense. I am deadly serious. Maybe it's because I went to an econ grad programme where Geertz was on the syllabus, but anthropology and economics always seemed pretty complementary to me. Anthropologists tend towards thick narratives describing the rituals we undertake in hopes of understanding the function they serve. Economists think about what ultimate good is being pursued in any action and how behaviours change with changes in the relative costs of undertaking different activities that further those ends. Whatever you might think about the rituals undertaken by your group, or somebody else's group, if you don't understand the functions they serve, you're going to mess things up if you blunder in with policies meant to change things. And so we come to drinking rituals. Why do people go out in groups and consume alcohol together before engaging in particular types of normally proscribed behaviours? If some young men drink excessively and take dumb risks, might there be any underlying reason? Anthropologist Anne Fox surveyed Australian and New Zealand drinking cultures for Lion; her report is hosted at Lion's website. One of Anne's very good points is that alcoholic disinhibition effects are culturally constrained. There are prescribed sets of things that are allowed or excused while drunk, with others very much not. The phrase “it loosens (or takes away) your inhibitions” is like a magical spell that releases drinkers from the normal rules of behaviour. Interestingly, the social rules of alcoholic disinhibition allow for certain behaviours but not others: no one becomes so disinhibited and ‘out of control’ that they steal or pickpocket from others, for example. Most people would not excuse theft because the person was drunk. Neither is it acceptable to insult or injure vulnerable members of society such as the elderly, handicapped or children. But taking off ones clothes, urinating (but not defecating), shouting, fighting, singing, flirting, and even going home with the ‘wrong’ person – are all blamed on the drink. That isn't to say that these cultural issues are easily changed. But I do worry that public ad campaigns and public education campaigns highlighting all the nasty things people do while drunk, instead of modelling appropriate drinking behaviour: they may reinforce norms about what drunken behaviour looks like rather than counter them. A lot of the recent NZ public service ads on alcohol have been good on this front, like ghost chips. I know a lot of the anti-alcohol brigade hates the paper, viewing it as trying to shirk blame from alcohol or divert attention from their preferred policies. But there are important points in here. If young people drink to overcome social anxiety, then maybe we should worry about stronger substitutability between alcohol and other anxiety relievers than we otherwise might have (though the strength of such things remains an empirical question). If adults get drunk together as a form of social bonding and trust building, what of that is forgone in population-based measures hammering on all forms of consumption? “Before I was 18 I thought it was so hypocritical that we couldn’t drink. The grownups would get drunk at the weekends and not let us have any so we used to sneak it and steal it all the time and feel so clever doing it right under their noses! When my Dad caught me drinking with a friend when I was 15 he yelled at me and I yelled back ‘well you do it!’ and he said ‘Yes but I know how to handle it.’ That is so hypocritical. Even then I could handle it better than he did!” – Female, 22. Practical suggestions for reducing night-time violence? Minimising the stuff that causes frustration and conflict: good availability of clean and safe toilets; good availability of late-night food service; visible but not heavy-handed policing; fines for infringement of public order (drunk & disorderly); and, decent transport options late at night. Fox also points to parts of the alcohol-aggression literature that I hadn't seen before. The common lab experiments there seem to provide alcohol in varying doses, then have participants react to a fictitious opponent's moves in different kinds of games. For example, if a fictitious opponent steals from your earnings or endowment, you (as subject) could respond by ignoring the opponent or punishing the opponent where punishment is costly. Increased punishment is taken as evidence of aggression in these experiments, but it's manifestly unclear to me that it should be taken as such. The experimental economics literature looks at altruistic punishment, where those in a public goods game can pay to punish a defector who hurts group performance. Punishment is there viewed as a second-order public good: if it is costly to you to punish someone who is behaving in ways that hurt the group, your punishment is altruistic, not aggressive. There are other kinds of studies drawing links between alcohol and aggressiveness, but I worry that lab experiments taking punishment as aggression might be missing an alternative explanation. In the standard spatial urban economics model, the marginal person has to be indifferent between living in different cities. That doesn't mean that all cities have to be identical but rather that, from the perspective of the marginal resident, the downsides and upsides of different alternatives come to a similar balance. Because Detroit has fewer amenities than, say, San Francisco, its housing prices have to be lower than those in places with better amenities and stronger opportunities. If that weren't true, people would move out of Detroit until housing became sufficiently cheap that there were no longer reason to move from one to the other. One reason for this is that houses are durable goods. Detroit built up a large stock of housing when the city's industry could support a much larger population. If people took their houses with them when they moved, housing costs wouldn't adjust downwards as much when there were substantial out-migration. Another reason can be time-to-build in high-amenity locations. Incoming migrants push up the price of the existing stock of housing; that provides a signal to developers to convert more houses into higher density uses and to expand on the fringes of town. High housing costs relative to incomes are then a disequilibrium phenomenon - they're something that happens in the interim until developers are able to get new housing on-stream. And you get a nice price gradient in the standard simple model where housing close to downtown amenities is very expensive to housing farther away, with the slope of the gradient depending on things like the ease of commuting and the desirability of the amenities. At the edges of the city, the cost of a house should be the cost of building it, plus the cost of providing basic infrastructure, plus the underlying base value of land in its next best alternative use. So median house prices relative to incomes can tell us a few different things. High prices would be associated with strong amenity values. But if there are also very high prices at the city fringes, or if the very high prices persist for a long time, there's also something else going on - something related to building new houses and apartments. You don't get sharp drop-offs in land values at metropolitan urban limits, or apartment buildings built to only 10 stories when another 5 stories would cost less to build than the apartments' sale prices, unless something else is up. What else can be up? Well, you could be in a place like Hong Kong or Singapore where there is little land available, and where much of the land that can be turned into high-rise apartments already has been. In places with hard physical constraints against further building, benefits of productivity increases or stronger agglomeration effects get capitalised into the price of existing land. Why? Spatial equilibrium: if people are just more productive in those places, that draws in more workers, which bids up the price of housing, which can't really draw in more housing supply, and then confers rents on the holders of existing land. In other places, it's zoning constraints. Both the metropolitan urban limit and the city height limits seem binding: Arthur Grimes showed strong discontinuities in prices at the MUL, and that apartment buildings are being constrained by height restrictions. Yes, Auckland has physical constraints on land supply too, but there are plenty of places that could be upzoned (and haven't) and land at the boundaries that could be brought into use as suburbs were it not forbidden. Peter Nunns really doesn't like Hugh Paveltich's median multiplier measure of housing affordability. Nunns says that because it ignores differences in amenities, it's worthless as a measure. Maybe I'm an easier grader than Peter, but I do find good value in Hugh's measure. Cities that persistently have high median multiplier measures and no particular physical constraints on further building likely have issues in regulations around land supply. If Detroit implemented strong restrictions against upzoning or new suburbs, it wouldn't show up in a median multiplier measure because the regulations wouldn't be binding - there's a large stock of housing available relative to demand. A high median multiplier does not necessarily follow from bad regulations, nor does a low median multiplier necessarily follow from good regulations in places with binding physical constraints. But a persistently low median multiplier in a city with a growing population likely signals accommodative regulations and a persistently high one in a city without strong physical constraints likely signals regulatory issues. The measure simultaneously tells us that places like Auckland have highly desirable amenities, and that they have pretty binding regulatory constraints against new building. …. 5 dolls immediately arrive. But Retail New Zealand spokesman Greg Hartford says the proposed online GST idea will help retailers that can’t compete with foreign websites. He says the cost to the government of not having an online GST system is somewhere above $200 million a year and adds that he expects this figure to climb as online shopping becomes more popular. “We’re certainly aware of retailers going out of business because they cannot compete with foreign websites. Mr Hartford disagrees that the higher level of bureaucracy will put smaller retailers off. Hartford would prefer that the threshold be dropped to $25. Both the above pieces also quote from our recent media release. I'm not sure about that $200m figure: it would require that Kiwis spend $1.3 billion on direct imports from abroad, or a bit over $300 per capita. Total retail spending in New Zealand last year was just over $20 billion. Is it plausible that 5% of retail volume is direct to consumer imports of low-value items? I'll assume that Hartford would wish the abolition of the biosecurity levy and the Import Entry Transaction Fee for lower valued imports - they add $47.29 in transaction costs for any import that runs through Customs processing, and $47.29 in fees on a $25 import (plus $3.75 GST) hardly makes sense. But abolishing those levies doesn't abolish the associated handling costs - it just shifts them to the general ledger. And without making it cheaper to process GST at the border, a $25 threshold necessarily imposes transaction costs far in excess of the revenues collected - and that's even imagining that the mechanism doesn't impose other hassles on customers. If Hartford, or anybody else, is able to come up with some better way of processing GST at the border, without imposing undue hassle on either those who might be deterred from exporting to New Zealand or on Kiwi shoppers, and without collection costs that exceed the value of GST collected, that would be great. @CricketFanBob Variety is often said to be advantageous, but has this ever been tested with data? May not be true. @ballsrightareas @CricketFanBob I wonder if we can interest @seamus_hogan to take on this challenge? 1. As @CricketFanBob asks, how do you define variety? 2. ...What is the best way of aggregating these bowling-type classifications into a measure of variety. 3.... How do you assess what performance a given set of individual bowler abilities would be expected to produce in order to assess whether variety (or its absence) can explain some of the difference? In particular, how do you control for the endogeneity that, for example, a spin bowler in spin-friendly conditions will probably a) be in a team with other spin bowlers to take advantage of those conditions, and b) likely to do better than average because of those conditions, making it difficult to infer any value to diversity that might exist. I have some ideas, but I suspect that the number of variables needed would exhaust the useful degrees of freedom. Any thoughts? It's interesting to contrast Alan Bollard's take on New Zealand with Daniel Davies's. Bollard's address for the NZ Initiative at PWC last week highlighted what the APEC Chair and former RBNZ Governor thought about the place: too little investment in the higher value R&D and marketing activities, too much hewing of wood and drawing of milk. Oliver Hartwich's summary is good. I asked him there what's stopping Kiwi businesses from picking up the $20 notes laying on the sidewalk if there are such great returns in those activities: whether Kiwis are just stupid; whether there are regulatory impediments to their being able to realise returns; whether they're already innovating and he's not noticed it; or whether a lot of that work is really better done elsewhere and that pushes for value-added here might not be value-destroying. He noted that Fonterra is constrained by its cooperative structure and that capital markets here might not be deep enough. I note that Fonterra is investing into Chinese dairy to have better understanding of and access to Chinese markets, that they're already doing a lot of milk processing beyond straight powder drying, and that opening to greater foreign investment seems a decent idea. I'm pretty agnostic about Fonterra's governance structure, but that too would seem a $20 note on the sidewalk: if they could be so much more valuable under a fully corporate structure, they will eventually convince their farmer-members of it. The key to understanding the economy of New Zealand is that it’s an industry cluster, and the industry in question is agriculture. Or, and this might be a bit more controversial, the industry in question is agriculture marketing, the most perfect example of which being the way in which the Chinese gooseberry was renamed the “kiwifruit” and production ramped up exponentially to meet US and European demand. At some point, if they can transport them without bruising, I’d guess that they’ll have a go at doing the same thing with the Feijoa, a kind of South American guava that’s very popular domestically. Marketing isn’t looked down on as a frivolous activity for people not clever enough to do science in New Zealand, as far as I can see – farmers, if they want to enjoy middle-class incomes, have to be very aware about the difference between the stuff that comes out of the ground or off the animal, and the sort of thing that people want to see in their shops. They are really very snappy about working out what the world wants and how to give it to them. Australian wine starts selling in the UK? Bang – New Zealand plants a load of vines. The Marlborough region develops a brand premium for Sauvignon? Bish bosh, ship truckloads of chardonnay grapes from Hawke’s Bay down to Marlborough and you can sell Marlborough Chardonnay too. Craft beer, did someone say? New Zealand agriculture is on the case, digging up the less successful vineyards and ramping up on a dozen new specialty varieties of hops. It is one of the few agricultural industries in the world which has basically no subsidies or tariff protections, and as a result they are just so much sharper and more responsive; it’s a perfect example for anyone wanting to talk about X-inefficiency in their economics class. What’s interesting is that the general level of awareness of agricultural matters, and of the trends and fashions in global foodstuffs, is very widespread and very detailed. Over a barbecue, my brother-in-law asked me why I thought it might be that Europeans were prepared to pay such big money for manuka honey these days, and mentioned that a friend of a friend had been putting in more beehives. He had no real personal interest in apiary as far as I could see – he has a good job helping to keep the dairy giant Fonterra’s vast logistics chain of tanker trucks moving. It’s just the sort of thing that one makes conversation about in New Zealand, same as I might, six months earlier, have asked someone at a similar party what they thought about house prices. House prices are a common topic of conversation too, by the way, it’s not a totally alien culture. From Singapore, Bollard's current home, New Zealand can seem lacking for want of the kinds of things that Singapore is very very good at. But Davies's take is more like mine. Some of the kinds of innovation here undertaken would have been next to impossible in supply-managed Canada. Lee Kuan Yew deserves the plaudits he today is receiving. Singapore is one of the world's truly great places, and it very likely would not have been without him. But it isn't a place I could comfortably have lived. When I was on the academic job market in 2003, I interviewed with an economics department in Singapore before heading down to Canterbury for an interview there. The city was wonderful, and I suppose I could have learned to live with the humidity and heat. But big moves should not be made in error, so I aim for the separating equilibrium. I asked a few questions about whether somebody who works in public choice could really ever fit well in Singapore given the political climate, and whether it would ever be a problem if I decided to turn to domestic issues rather than stick with American and Canadian data. There were awkward pauses and looks back and forth; I had my answer. I didn't get a job offer in Singapore, but neither could I have accepted one - it wouldn't have worked well out for either of us. I rankle when there are areas I'm forbidden from looking at - it makes them all the more tempting. The department's Chair was very happy for me when I told him I'd taken an offer at Canterbury, telling me my work would be a much better fit in New Zealand. He wasn't wrong. Before the current cricket world cup started, the International Cricket Council (ICC) announced that the next event (in 2019), would feature only 10 teams, the eight highest-ranked to qualify automatically, and two to be selected by a qualifying tournament to be played in Bangladesh in conditions totally different from the ones that will prevail in the tournament proper, which is to be held in England. This is a quite horrible policy. Quite apart from it being totally detrimental to attempts to develop interest in the game in countries outside of the traditional powerhouses, the presence of the so-called "associate nations" in the current tournament has given it so much of its colour, both through their players and their fans. It may be the games at the pointy end of the tournament that matter the most in terms of finding a winner, but the games involving associate nations in the group stages were wonderful celebrations of the game, and a tournament without them would be so much poorer. [T]he World Cup itself, the premium event, without exception should be played between teams that are evenly matched and competitive. Twitter is having a field day with this, as the games involving two top-eight teams in this world cup have been anything other than competitive, including the four quarter-final matches. This leaves me to wonder if there is anything in the rule changes that were brought in a couple of years ago that are making games less competitive in the sense of seeing fewer games where there is real uncertainty about the outcome until late in the second innings. The results in the current tournament are exhibit A for the hypothesis that games are becoming less competitive, but it may be that there has simply been a widening in ability between the top and bottom teams in the top 8. I believe, however, that there is good theoretical reasons to expect to see fewer close finishes, even in games between evenly matched teams. To explain, consider the following fictitious game. I go first and draw 10 random numbers from a distribution, and my score is the sum of the 10 numbers. Before each draw, I can choose the mean and variance of the distribution, according to a menu of choices in which there is an inverted-U shaped relationship between variance (on a horizontal axis), and mean (on the vertical). I maximise my expected score by choosing the variance in the middle aligning with the peak of the upside-down U. To complete the game, my opponent also draws 10 random numbers, choosing from the same menu the mean and variance before each draw, and wins if his total exceeds mine. Now if I luck out and get a very high score, my opponent will be best advised to choose a high variance strategy. Occasionally, he will succeed in chasing down my high score, but most likely he will fail and lose heavily . On the other hand, if I have very poor luck, my opponent should choose a low-variance strategy, which won't maximise his expected score but will maximise his probability of beating mine. In this case, he will likely win easily. On average, the player going second will win more than 50% of the games as he will have the chance to adjust his strategy to the score of the player going first. a decrease in the number of games where the result is still uncertain when the player drawing second only has 2-3 numbers left to draw. So what is the cricket analogy here? We know that batting teams have a lot of control over the level of risk. Bowling teams also control risk levels, mostly through decisions on how attacking to make their field settings), but we also know that faster scoring happens in the first innings as wickets become less costly to batting teams, suggesting that the batting teams have more strategic control over risk. So in my analogy, the player drawing first and choosing the risk level is the team batting first, and the advantage to the second player is the second-innings advantage that is borne out in the data but not always accepted by captains when they win the toss. The rule change I am thinking of is the restriction to having no more than 4 fielders outside of the circle in non-power play overs, down from 5 previously. Now having more fielders inside the circle makes it harder for a batting team to score if they are playing conservatively, but makes it easier to score when taking risks. The fielding restrictions then gives the team batting first an incentive to take more risk. We saw this when the batting powerplay was first introduced. It only increased the average score of the team batting first by about 4 runs, largely because games where the batters were able to use it to heavily increase their scoring were balanced by others where the powerplay led to a quick loss of wickets. a decrease in the number of games where the game is still in the balance late into the second innings. I probably won't get a chance to crunch the numbers any time soon, but if anyone wants to run with testing these hypotheses with the data, be my guest, I'm happy to be a co-author. Christchurch Art Gallery's budget is being hit in the latest round of Christchurch Council austerity measures. The Christchurch Art Gallery's fund for purchasing artworks will be cut by more than two thirds under wide-ranging budget cuts proposed for the arts. The cuts mean the gallery's art buying fund will fall from $250,000 a year to $80,000 a year, making it one of the most poorly funded art collections in the country. It has to trim 6 per cent from its budget over the next three financial years as part of operational spending cuts proposed in the Christchurch City Council's draft long-term plan. Under the cuts, the gallery would host about 12 exhibitions a year compared to about 18 before the 2011 earthquakes, reopen later this year without some hoped-for building improvements, and not replace some staff cut after the earthquakes. Gallery director Jenny Harper said the cuts would mean more reliance on external fundraising. "Everyone knows that $80,000 doesn't buy you much, even from younger and less established artists. "It is fair to say that this is a city with multiple priorities. We will still be able to buy a few things and we will still be able to receive gifts and fundraise. We will be increasingly reliant on community funding to build the collection." One potential solution for new acquisitions? Crowdfunding through PledgeMe. The latest Art Gallery bulletin has entries from a few folks on crowdfunding and the arts. I've copied mine below. Crowdfunding is a new take on an old method for funding the arts: patronage. Count Ferdinand von Waldstein earned lasting fame by his early sponsorship of Beethoven. While patrons supporting the arts through Kickstarter can hardly expect similar name recognition, they can similarly enjoy a sense of part-ownership of the final production. Arts patronage was typically, and remains, the domain of the wealthy. Smaller patrons could never really be sure how much difference their contributions made. Consequently, donations can suffer from what economists call a public goods problem: because everyone can benefit from a work when it is produced, it is often best to sit back and wait to see whether the work might be produced without your contribution. And so arts organisations provide special bonuses for members of their affiliated groups of supporters. While this comes some way towards solving the public goods problem, crowdfunding alternatives provide a more direct approach: no donor is charged unless the project has enough pledged support to go ahead. Each donor can then feel part-ownership of the project. Because of the donor's support, along with that of like-minded others, an artist could make something new and beautiful – as judged by the donor. The New York Times reported in January that the traditional fine arts have some of Kickstarter's highest success rates. The public goods problem remains where some would-be supporters delay pledging in hopes that the threshold is reached without their contribution. Clever crowdfunding initiatives can mitigate the problem by providing bonuses to early pledgers, like signed tokens from the artists that can be produced at low cost but are of high value to supporters as it enables them to display their affiliation and support. Even better, arts organisations can use crowdfunding mechanisms to gauge support for the different initiatives they might undertake. A gallery could propose commissioning several different works; patron support through PledgeMe would determine which were commissioned, and supporters could receive small versions of the commissioned work in acknowledgement, from pins through prints. PledgeMe supporters of a [hypothetical] Christchurch Art Gallery commission of a new painting (by an artist like Jason Greig, for example) would hardly earn Waldstein's fame. But, a supporters' limited-edition lithograph of the newly commissioned work could be fame enough for many supporters – including me. When the city can barely manage to get its roading in order post-quake, art gallery acquisitions are a luxury - though I'd agree with anybody arguing that the anchor projects need a strong re-think in the current budgetary environment too. Gallery collections can be supported through donation though. The Press reports that the Challenge Grant, where Council matches raised funds, will remain at $220,000 per year. Were this dedicated to acquisitions where half the cost were covered by crowdfunding, the Gallery could nicely leverage the crowdsourced contributions and ensure that it acquires the pieces that its patrons think most valuable. And my offer to pledge towards any new Greig commission, in exchange for a lithograph, stands. I'm so annoyed that I didn't pick up his early pieces when he showed at Gallery O in the Arts Centre. Just didn't have the budget for it then. Not sure that I'm a fan of the latest idea for applying GST on lower-valued imports. Recall that New Zealand uses a de minimus minimis regime - no tariff or GST applies for imports where the total amount that would be collected is less than the cost of collecting the tariff. For most goods, that works out to a $400 threshold on purchases. In some first-best world, in which tax collection at the border were effortless, there would be no GST threshold and all goods consumed in New Zealand would attract the same tax treatment, regardless of whether they were bought domestically or imported from abroad. In a world with collection costs, we trade off between the distortions caused where the absence of GST encourages more imports, and the distortions caused when the application of GST at the border introduces hassles that discourage consumers from importing when it would be efficient for them to import, or discourage foreign retailers from shipping to New Zealand. Bundled into all of that as well is that a very liberal importation regime can provide strong competitive pressures in sectors with weaker domestic competition. The Prime Minister suggested coordination through the OECD as potential solution. In that scheme, as best I understand it, anybody wishing to export to an OECD member would need to register with some agency and collect sales tax on behalf of the country to which the goods were being shipped. So Amazon, for example, would need to register, then pay GST to the New Zealand government on all shipments to New Zealand. Where New Zealand could never convince anybody else to collect taxes for New Zealand, the joint approach could have larger firms do so. First off, while big firms would do it, what are the odds that smaller US-based firms would want the hassle of dealing with a myriad of international tax rules? There are already plenty of American firms that don't want to bother with international shipment - that's why YouShop exists. More would stop shipping internationally. While it's simple to say "tech will fix it" and that retailers would only need to put some product characteristics into an online form to figure out what tax applies, none of that is simple. Canada exempts kids' clothes from GST but not adult clothes: do you know if your customer is a kid? The UK has weird delineations around what counts as which types of foods for tax purposes. I wonder how many Etsy sellers currently shipping internationally would still want to do that if they had to figure out exactly into which category their products fit, on pain of, well, pain if they got it wrong? It gets worse if subnational taxes also need be applied and collected. Canadian provinces vary in sales taxes. America has over 8000 different local taxation regimes, some of which issue 1,437-word memos on which kinds of ice-cream sandwiches are taxable and which kinds aren't. It seems ridiculous to imagine that some simple "put in a few product details" form would solve this. If the US does move towards a harmonised interstate sales tax regime, things would be simpler, but we aren't there yet. And that leads into the second problem. New Zealand firms selling to NZ consumers have to deal with GST - which is pretty simple in the grand scheme of things. NZ firms selling directly by mail order to consumers abroad do not have to collect taxes on behalf of foreign governments. Do we really want a world in which would-be exporters from New Zealand need register with the OECD and figure out a pile of international tax issues to, say, ship a set of sheepskin slippers to somebody in the US? Those in Wellington might wish to join us on Monday night for the launch of Jason Krupp's report on regulatory reform in mining. Jason shows that we're well inside the production-possibilities frontier: we could get both more mining and better environmental outcomes with a few regulatory changes. That was Jean Chretien, 2002. Osborne, who has risen from electorate treasurer to potential MP in just weeks, even warned a flagship National roading project to extend State Highway 1 as a motorway further into Northland, could be derailed if Peters beat him. "If the people of Northland want the Puhoi to Wellsford motorway extension, which is vital to open up Northland to our biggest market . . . if we want that, there's only one choice, and that's to vote for me," Osborne said. If he lost the by-election there was a "real risk" the road might not go ahead. Surely the PM will clear this up and confirm that his candidate really didn't mean what it sounds like he meant. Jenesa Jeram and I have an essay out explaining the merits of economic growth. We released the piece at this year's New Zealand Initiative annual retreat last night in Auckland, with Finance Minister Bill English discussing economic growth as part of the launch. For most pollutants, it got worse before it got better. Before the Industrial Revolution, the environment was far from pristine. Rivers were used as sewers. Indoor air pollution was particularly bad. Chimneys were not always particularly efficient, and open fires made for very smoky interiors. Rather than find a time machine, we can look to Tibetan nomadic tribes who use yak dung as winter fuel. Traditional cookstoves there make indoor air a health hazard and an underappreciated source of black carbon, which contributes to global warming.43 Early industrialisation made things worse: the outdoor air became smokier and rivers bore more sewage and waste to the sea. Economic growth brought greater prosperity but worse environmental conditions – especially in the cities. London’s pea-soup fogs became legendary but were not fantasy. Coal fires within the city, combined with industrial smoke, made for deadly conditions. This first-worse-then-better U-shaped relationship between economic growth and environmental quality is called the Environmental Kuznets Curve. The curve was first described in 1991 by economists Gene Grossman and Alan Krueger, who wanted to test whether free trade between Mexico and the United States was likely to worsen or improve environmental quality in Mexico.46 Trade opponents argued that American industrialists would set up factories in Mexico to take advantage of less restrictive environmental regulations, exporting pollution. Grossman and Krueger argued instead that free trade would increase incomes in Mexico and consequently reduce pollution. Grossman and Krueger found that when per capita GDP reached US$4,000– $5,000 in 1985 dollars, or about US$10,000 today, sulphur dioxide and smoke levels started improving with economic growth rather than worsening. Mexican per capita GDP rose in real terms from about US$4,000 in 1992 to about US$10,000 in 2013. In 2010, a Washington Post headline announced: ‘Mexico City Drastically Reduced Air Pollutants Since 1990s’.47 If anything, Grossman and Krueger were too pessimistic about how long it would take for outcomes to improve. Environmental economist Susmita Dasgupta and co-authors reviewed the overall performance of the Environmental Kuznets Curve literature and, with some reservations, ultimately sided with the optimists.49 Dasgupta, et al. argued that the most plausible long-run forecast is for improved environmental quality in both high- and low-income economies. Economic liberalisation, improved information, better technology, and more stringent and cost-effective approaches to regulating pollution in developing countries have begun to ‘flatten’ the Environmental Kuznets Curve. In short, economic growth now brings improved environmental quality earlier in a country’s development than it did when pollution control technologies were first being developed. It is easy to see how the Environmental Kuznets Curve effect works, and when it does not. When a city’s air is unbreathable, and when the city’s residents are rich enough to switch from coal heating, government regulation becomes an easy and effective way to solve the problem. Any one household switching away from coal heating to, say, gas heating, would experience all the costs of the switch, but because the problem is so vastly bigger than that one household, it would not notice any improvement in outdoor air quality. Things like the deadly London fog can spark change through policy – when city residents can afford alternatives. Economic growth both makes alternatives cheaper, through improved technology and widespread use, and encourages households rich enough to afford to do better. By contrast, a town with high greenhouse gas emissions is not necessarily a worse place to live than one with lower emissions: you cannot smell or taste the difference. Solutions then require national or international agreements rather than local action: any town, city or small nation imposing strong local restrictions would be in the same position as a London household choosing not to burn coal in the early 1950s, bearing all the local costs but not reaping any of the benefits. London’s smog led to a ban on coal-based heating. If Chinese carbon dioxide emissions drop with the Chinese government’s promise to reduce emissions from 2030 onwards,50 it will more likely be due to pressure on the government to deal with the effects of urban coal-burning than from any general commitment to climate change. On the whole, then, the evidence on the Environmental Kuznets Curve is mixed. While economic growth reduces ‘local’ pollution, it does not mitigate pollution felt farther afield. And, as economist Bruce Yandle explains, strong property rights help make the link from economic growth to improved environmental quality.51 Strong property rights both increase income and provide ways for those affected by pollution to sue polluters for the damages caused. Yandle cites research showing that economic growth turns more quickly into improved environmental outcomes in countries with strong property rights. Would you rather be downstream from a factory making a mess of the river in New Zealand, or from a state-owned enterprise in China doing the same? The link between economic growth and environmental quality depends on strong property rights and a political system that lets individuals ‘buy’ better environmental quality as they get richer and can afford it. It is entirely right to worry about the effects of environmental regulation on economic growth, as it is possible to spend too much on anything – and doubly so when the government is doing the buying on our behalf. But the right amount of environmental quality does go up as people get richer and can afford it, both in their private decisions and policy preferences. The ongoing risk is in striking the right balance. Consider climate change and economic growth. While richer countries get a lot more economic output for every tonne of carbon dioxide released into the atmosphere, greenhouse gas emissions in total show little sign of reducing with economic growth. Or, at least, the world has not yet seen income levels at which the curve bends downward. Reducing greenhouse gas emissions may pass cost-benefit analyses, especially where it is viewed as buying insurance against the kinds of outcomes that, while unlikely, would be very harmful.52 Such reductions will come at a cost for economic growth. Substantial greenhouse gas abatement may be worth that cost, but it is critically important that we weigh the case fully. Wealth provides us a general purpose ability to deal with harmful outcomes. Curbing economic growth to reduce global warming necessarily leaves the world more vulnerable to other risks not associated with greenhouse gas emissions. We can think about it this way. Imagine you could either buy a house insurance policy that gives less-than-full protection against a range of threats such as fire, earthquake, typhoon, tornado, flood or landslide, or you could buy an insurance policy that makes sure you never suffer any damage from flooding but does not help you in case of anything else. Do you feel lucky? Never a bit of good news for my old neighbourhood. The South Brighton Campground is again scheduled for closure. Council reckons it too expensive to fix up the quake-damaged toilet and kitchen block, estimating over $2m in capital savings should they shut it down. A council document that forms part of the draft Long Term Plan adopted by city councillors last week says extensive damage has rendered the future of the camp "precarious". It estimates the council could save between $2.3 million and $3m in capital expenditure if it closed the park. Lessees Lyn Pilling and Dom Brownin are questioning those figures, and say the council seems hell-bent on closing the camp even though it attracts visitors and money to the area. Pilling and Brownin have run the holiday park since 2005, but they have been operating on a month-by-month lease for more than three years. "You can't operate a business like that - it's just killing us," Brownin said. The couple could not walk away from the business because they had invested significantly. They had had no formal contact with the council since January 2014 and had been unable to progress their plans. "Our financials are great and the business is very strong. We could easily stand on our own two feet without the council," Brownin said. If the council doesn't want to pay for new kitchen, ablution block then let the lessees do it ,and give them a good long lease to make the expense worth while. If people can park caravans and pitch tents there now, how much land remediation is really required to make it fit for purpose? If the council closes the Camping Ground, closes Rawhiti Golf Course, has already decided not to replace QEII facilities in the east, including Ascot Golf Course , Hydroslides and all the great leisure pools and other sports facilities that were there, move tennis and hockey facilities to the new sports hub on the other side of town, do little to attract people to New Brighton what the hell are people on the East paying rates for because we already know it's our roads that won't be fully repaired for at least thirty years. Letting the lessees do this through a long-term lease not only lets a valuable facility continue to operate, it also builds in robustness against future potential earthquakes: functioning campgrounds can make for excellent emergency facilities. The campground was just down the road from our old place. When we were hosting lots of family from Canada, my sister and brother-in-law stayed at the campground and we'd walk over to visit. It backed onto the reserve's walking trails and was about a five minute walk to the beach. Capital gains taxes still do not make economic sense. Here's Scott Sumner explaining that while wage and consumption taxes can be equivalent, capital gains taxes are effectively a distortionary tax on future consumption relative to present consumption. 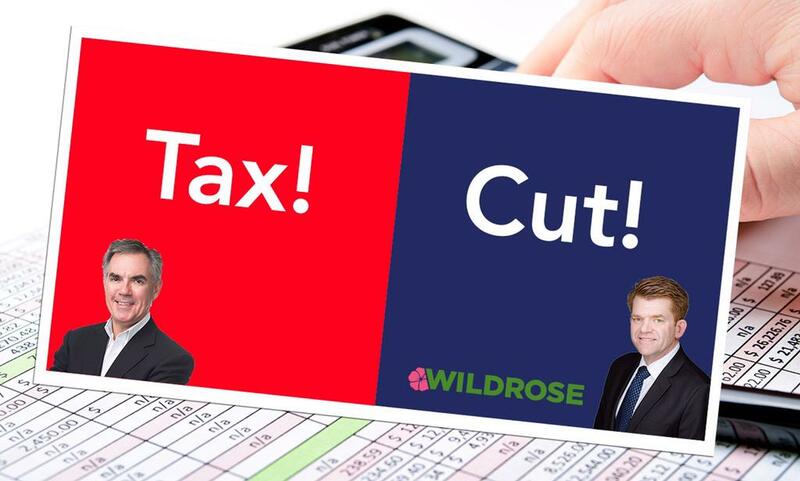 The biggest confusion is that people don’t understand why capital income should not be taxed, and why a wage tax is equivalent to a consumption tax. Consider someone with $100,000 in income, who can choose to consume, or invest in a fund that will double in value over 20 years. Suppose we want to raise revenue with a present value of $20,000, from this person. We could have a wage tax of 20%, and raise $20,000 right now. Let’s also assume that this person decided to spend 1/2 of his after-tax income—leading to $40,000 in consumption today, and save the other $40,000, leading to $80,000 in consumption in 20 years. Note that both current and future consumption are reduced by 20% relative to the no tax case. Alternatively, we could directly tax consumption at the same rate (say with a VAT). Let’s assume the person saved $50,000 and spent $50,000 on consumer goods. After paying VAT they consume $40,000 today, and the government gets the other $10,000. After 20 years the $50,000 saved turns into $100,000, but you must pay $20,000 in VAT, leaving consumption of $80,000. Exactly the same as with a wage tax. The total revenue to the government looks bigger, but is the same in present value terms. In contrast, an income tax doubles taxes the money saved, once as wages, and again as capital income. So now it’s $40,000 consumption this year, and only $72,000 in 20 years ($80,000 minus 20% tax on the $40,000 in investment income), an effective tax rate of 28% on future consumption. And of course with inflation the effective real tax rate is still higher. Income taxes make no sense at all; if you want progressivity, tax big consumption more than little consumption. What's a progressive consumption tax? A tax on income minus savings. In that set-up, you'd want to tax returns on investments (capital gains or interest or dividends) that were made in tax-preferred savings vehicles (and effectively then came from before-the-line pre-tax income). As Scott points out, that's not a tax on capital gains or capital income, it's a deferred tax on labour income. Sumner proposes something pretty close to what New Zealand has. We get progressivity via the income tax rather than via a progressive consumption tax, but we don't tax capital gains, and we doimpose a fringe benefit tax that helps in avoiding nonsense: he proposes that company cars that can be used in off-hours are consumption, not investment; I'm pretty sure those here would attract FBT. Capital income is taxed though, and investment yielding capital income coming out of wage earnings is then double-taxed. And all of it is highly reminiscent of Seamus's series of posts explaining how capital gains taxes are a bad idea. I get tired of commentators who point to National's reluctance to impose capital gains taxes as evidence that they're somehow bought out by moneyed interests when the economics on capital gains taxation are at best pretty iffy. Gareth Morgan argues that New Zealand needs to do a better job in extracting all the surplus from tourists. He first argues that foreigners buying property here would pay a fairer tax share under comprehensive capital income taxation on the value of their purchased property. A lot here would hinge on relative elasticities. Suppose that foreign demand for NZ property is completely elastic (there are close substitute countries where rich people might go instead) and that domestic property supply is completely inelastic. Under those assumptions, we would see a one-off drop in property values equivalent to the present discounted value of the future tax flow. Some money currently being paid by foreign investors to Kiwi owners would instead go to the government. If demand for NZ property is more elastic than the supply of NZ property, which seems likely, then the proposal mostly transfers money from current owners to the government. And the more elastic the demand for NZ property among foreigners, the more foreign buyers are deterred by the regime. He goes on to worry about costs imposed by tourists. In some cases, he's right - but in those cases it points to a problem that's broader than tourists. He points to costs imposed by tourists when they have car accidents; if tourists do have disproportionately more accidents, then ACC car registration levies on cars run by car rental agencies should be higher than those on residents' cars - the problem is one of inadequate premium sensitivity to realised risk than one of tourists per se. And while he's right that the system should charge tourists when they wind up needing costly rescue operations from mountaintops or ravines, the system really should charge whenever there's recklessness - whether from tourists or locals. But we could and should go even further. This season the Great Walks are enjoying record numbers of tourists. Again these are taxpayer-funded facilities so why shouldn’t the taxpayer get a direct return on that investment, at least to cover the track maintenance? We already charge for hut beds so clearly are not allergic to the user-pays ethos, but extending this to foreigners having the right to use of National Parks again seems a no-brainer. Again that levy could be collected at the airport as part of a bundled “taxpayer-provided services levy”. And it shouldn’t stop here. In instances where there are direct charges for the services provided by central- or local-government funded or part-funded amenities, we could simply have a separate and higher charge for foreigners. Zoos for example could levy that – as the example in the photo illustrates at Darjeeling zoo, foreigners pay 2.5 the entrance fee that locals do. We already do this at the Waitangi Treaty Grounds, presumably because there is value in New Zealanders visiting this historical site. Why not extend this approach to other sites – such as Te Papa, Zealandia, and the plethora of other Zoos and Museums that receive taxpayer and ratepayer subsidies? On the other hand, tourists pay 15% GST on everything they buy here and only can reclaim GST on those goods they bring home with them - if they can be bothered to fill in the paperwork. Further, tourists already pay more for facilities like zoos where locals can often profit by purchasing annual passes that pay for themselves after two or three visits. And where tourists are cost sensitive, tourist-soaking levies on some facilities will reduce the amount tourists spend elsewhere. Bigger picture, cities like Wellington do pretty well out of tourists. Sure, they can be a bit annoying for locals when Lambton Quay is jammed if two cruise ships are in port at the same time, but we're able to support a better variety of restaurants and bars than we could without them. Finally, in a world where public facilities are directed to soak tourists, they need a way of identifying locals. That means we'd all need to show our driver's licence for entry to these facilities. But why stop there? Councils fund a lot of art galleries; you might need to bring your power bill or some other proof of local residence to get discounted admission: a driver's licence wouldn't be enough. Or maybe Councils would start issuing special residents' cards. People who sound local would likely not be bothered to pull out their IDs when entering facilities, but folks like me who still have a Canadian accent after being here for more than a decade would have to stump up every time. It's that last bit that sounds particularly unappealing. I know Morgan's framing this as being an anti-Winston-Peters thing, but I'd reckon that Morgan's soak-the-tourists proposals have a lot better chance of passing in a world in which New Zealand First has the balance of Parliamentary Power than one in which they don't. I'd hit on related topics in last week's NZ Initiative "Insights" newsletter. A Canadian's on trial for failing to give Canada Customs his passwords on crossing the border. A Quebec man charged with obstructing border officials by refusing to give up his smartphone password says he will fight the charge. The case has raised a new legal question in Canada, a law professor says. There should be a high hurdle for having to turn over personal details like cell phone contents to the state. If a judge is convinced of the need for it, on having seen sufficient evidence, that's one thing. But just on the request of somebody in a customs uniform? Fortunately, this stuff so far is confined to the asylum: Oz, the US, Canada and the UK. Unfortunately, Customs NZ wants us to enter the asylum too. Customs is seeking new powers including requiring a person to provide a password or access to their electronic devices. The agency has also floated other possibilities including collection of biometric information and making passengers empty their pockets if asked by an officer, even if there is no reasonable suspicion. A discussion paper on changes to the Customs and Excise Act has been released, outlining a number of changes the agency wants considered. Currently, when Customs examines a person's electronic device the owner is not legally obliged to provide a password or encryption key. It is relatively uncommon for people to refuse to provide this, Customs notes in the discussion paper, but "the number who refuse may increase as technology continues to develop". If people do refuse, Customs notes it "can mean we have no way of uncovering evidence of criminal offending even when we know the device holds this evidence". If there's no way for Customs to get a warrant currently, then that should likely be looked at - although the hurdle here should be high too and Customs should be spanked if they too frequently make warrant requests that are turned down. People in the Customs line are easily subject to intimidation, and a "Well, you can either unlock your phone, or you can wait here for hours and hours until we get a warrant" is coercive. Is the whole world going mad? A friend, who is a lawyer, had confidential, lawyer-client privileged information on her laptop relating to a multi-million dollar business deal.Border guards demanded that she give them her password... They told her it was either not enter the country (and forfeit the deal) or give up her password. Her issue was that she was exposing privileged information to third parties who could, potentially, have illegally profited from the knowledge contained in that laptop. At present, borders are dangerous legal limbo. This area needs deep oversight and clear paths for travellers to have recourse to constitutional rights. The potential for state-sponsored corporate espionage through this mechanism should not be dismissed. Recently, the Washington Post wrote an article titled “to improve schools, let teachers run them”, about 70 U.S. schools that are completely teacher run, where kids are engaged and achieving. Here is the rub. They are charter schools. Teacher unions see charter schools as a threat to their existence, but they could also provide some opportunities to improve the status of teachers in the public eye. Imagine, for example, a professional arm of the PPTA setting up a fund to sponsor a group of teachers to start New Zealand’s first teacher-led charter school. [T]he U.F.T. charter has consistently been one of the lowest performing schools—charter or otherwise—in the city and has received stern warnings from its authorizer, the SUNY Charter School Institute, about its viability. Last year, SUNY issued a report on the U.F.T. Charter School in which it documented instability in leadership, low test scores particularly in middle school grades, lack of resources and disciplinary issues. The school has been an embarrassment for the union from the get-go, starting with an unfortunate 2005 incident in which its principal ordered two boys to clean up another student's feces off the bathroom floor, which, of course, made the tabloids. Since then the school has been plagued by principal turnover, textbook and material shortages, and fiscal problems. There have been 10 reported incidents of corporal punishment. This hardly damns the model, so long as the system can expeditiously identify failures and either fix or close them. But it does not speak well of the operator. We've had Duckworth Lewis for decades now and, even if the mathematics of it is beyond most casual fans, the basic concept that wickets remaining are a resource that need to be considered along with overs remaining is pretty well established. Lawson is right, although maybe not quite. In this quote, he seems to be suggesting that a team that is heading towards a very low score might as well start taking more risks to get to a competitive total. This is a manifestation of a mathematical theorem known as Jensen's inequality, when optimising over a relationship that is not linear, but actually, the relationship between the total score and the probability of winning is pretty much linear over the range of possibilities that can occur on any particular ball. That means, that a batting team should always ignore the current score, accept bygones as bygones, and base their level of aggression on how many balls and wickets they have remaining. As it happens, we can quantify this decision reasonably precisely. The graph below gives a measure of what I like to call "deathness" for the first innings. The particular metric I use is the payoff to a risky single. Imagine that the batsmen have to choose between trying for a run or not. If they choose not to run, they will score 0 runs but not lose a wicket. If they try for the run, there is some probability that attempt will fail and one batsman will be run out, or they might succeed. What probability of being run out would be too high to make the risk not worth the cost. The graph shows that cross-over probability as a function of the number of overs bowled, for each possible number of wickets lost. The higher is the probability, the greater is the risk that it is worth taking and so the greater is the level of deathness (so called, because the final overs in an innings where batsmen start to take higher levels of risk is often termed "the death"). The actual numbers aren't particularly interesting (most decisions on aggression are about striking the ball, not about whether to attempt a run), but the comparison across different lines in the graph is revealing. So, for example, the graph reveals that if a particular level of aggression is warranted after 40 overs when a team is 5 wickets down, then the same level can be justified at 23 overs if no wickets have been lost. So let's now think about batting out your overs. In the World Cup game between New Zealand and England, England batting first lost their 6th wicket at 28.1 overs, their 7th later in the same over, and their 8th at 30.4 overs. 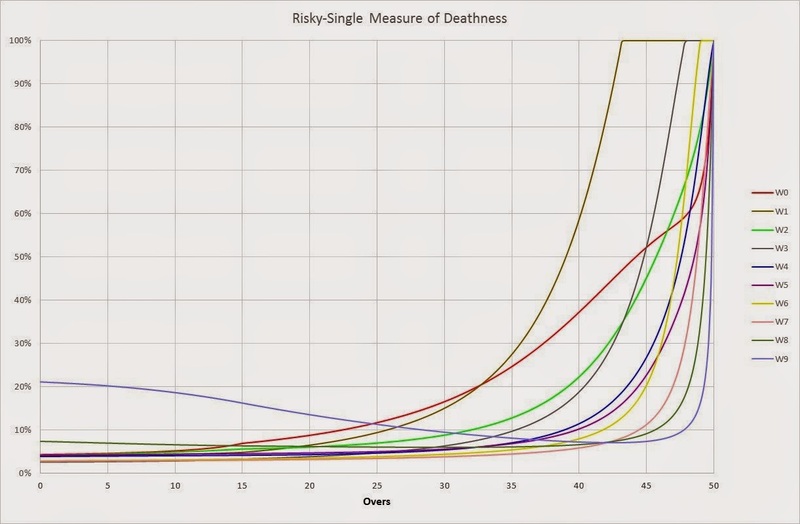 Looking at the purple, yellow and pink lines, the deathness measures at 28-30 overs, are all pretty much the same. Yes, a lot more caution was called for than if they had only been 2 wickets down at that point (and so Broad's approach at that point was probably not beyond reproach), but also the optimal strategy was not for the team to go into its shell. Rather the situation called for playing in much the same style as any team should do in the middle overs (10-30) but delaying all-out aggression for a bit longer than if they had more wickets in hand. This pretty much describes any situation where the "make sure you bat out your overs" comment is likely to arise. A team should probably delay its all-out assault for a bit if it loses too many wickets, but at no point should it bat more conservatively than in a normal middle-orders situation.